Using the easy to use Bucks Single-Part coating system with no mixing required and brushes and tools can be washed in warm soapy water. Bucks Single-Part has a very long working time and 24 hour cure time. Model aircraft wings can be designed by you then www.foamwings.co.uk can cut and supply your foam wing cores. Cut the balsa sheet to size or tack the balsa sheets together with cyano glue to the required sizes. I am using 1/32 inch balsa sheet. Working on one wing panel, coat the four surfaces of the balsa sheeting and the foam which needs to be bonding together with Bucks Single-Part coating system. Replace the foam cores with the balsa sheets back into their foam shells and check for alignment then weight down with weights. The leading and trailing edges cannot have the balsa sheeting wrapped around, so a balsa profile will need to be bonded on and shaped. Repeat the process on the other wing panel. Lightly sand the balsa wood sheeting smooth with 400 grade sanding paper used dry. Select the required weight of glass fibre woven cloth (25g or 49g) and cut to size leaving an inch overhang around the wing. Gently smooth out any wrinkles in the glass cloth. Mix up a quantity of resin and hardener about 60grams and put into a roller tray and load the roller and working from one end of the wing saturate the glass cloth using the roller right down to the other end. Mix up more resin & hardener as you go. When saturating the cloth notice the colour change from white to clear. Make sure there are no white glass fibre woven cloth dry area’s visible. 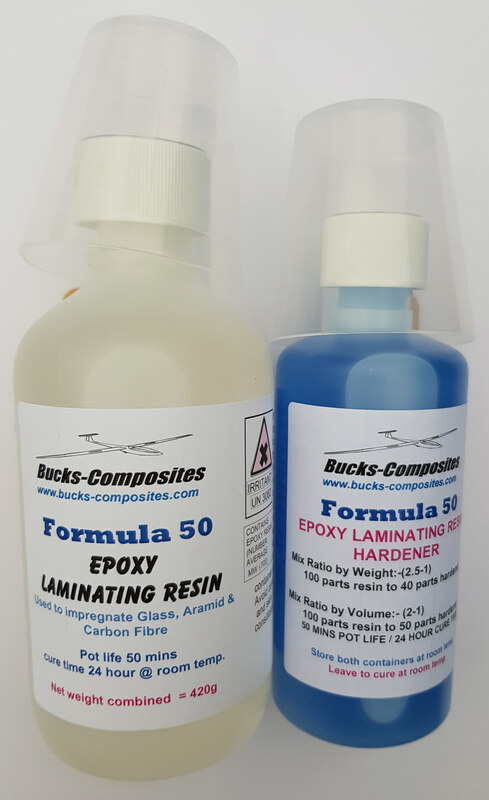 If using Bucks Formula 50 resin and hardener then the working time is 50 minutes if placed into a roller tray to prevent heat build up. Now check that there are no shinny patches of surplus resin on top of the glass fibre woven cloth. If there are then mop up the surplus resin with absorbent paper. Now leave to fully cure before repeating the process on the other side. Now lightly sand wet with a few drops of Fairy liquid added to the water and using 400 grade wet or dry paper which does not take long if not too much resin used. Clean the wing and leave to dry. Now mix up a further quantity of resin and hardener and use a Bucks synthetic coating brush the fill the weave of the glass fibre woven cloth. The brush can be cleaned with Epoxy Thinners. Leave to cure and then repeat the process on the other side. Another gentle sand with 600 grade paper used wet with a few drops of Fairy liquid in the water. The wing can be sprayed with primer and allowed to dry and lightly sanded then top coat of paint can be applied.